B’ e Jean-Jacques Rousseau (Genève, 28 an t-Ògmhios 1712 – Ermenonville, 2 an t-Iuchar 1778) sgrìobhadair agus feallsanaiche à Genève san Eilbheis. Bhuineadh Rousseau do theaghlach iriseal Pròstanach. Bha athair na uaireadairiche agus chaill e a mhàthair nuair a bha e uabhasach òg. 'S piuthar-athar a thog e suas. Cha do deach e idir chun an oilthigh ach bha e na fhoghlainnteach fo nòtair. Dh’fhàg e Genève ann an 1728 is chaidh e chun na Frainge. Chuir e seachad mòran bhliadhna an siud is e a’ fuireach ann an Chambéry, far a leughadh e tòrr is far an do leig e dheth a’ Phròsdanachas. Bha e fo bhuaidh a’ Bhan Iarla Warens, a leannan. Ann an 1742 chaidh e gu Paras. Chruthaich e siostam ùr airson Ceòl a sgrìobhadh is bha e na rùnaire Tosgair na Frainge ann an Venise fad bliadhna. Phòs e le Thérèse Levasseur ann an 1768 an dèidh còignear chloinne fhaighinn leatha. Bha e an sàs ann an Encyclopédie a chuir D’Alembert agus Diderot air dòigh agus fiù 's bhuannaich e duais airson a’ chiad rud a sgrìobh e, air an robh Discours sur les Sciences et les Arts, ann an 1750. Thill e gu Genève ann an 1752. B’ fheudar dha a ghabhail ris a’ Phròstanachas gus a chuid chòirichean mar neach-dùthcha fhaighinn air ais. 'S ann an-siud far an do sgrìobh e leabhar eile, Discours sur l’origine de l’inégalité entre les Hommes ann an 1755. Bha Rousseau dhen bheachd gur e creutair sona sunndach nàdarra a bh' ann na daoine, is gur e dìreach saoghal nan daoine fhèin a bha a’ cur dragh oirnne. Sgrìobh e dà leabhar cudromach ann am Montmorency, nuair a bha e na thàmh aig taigh Madame D’Epinay. Julie ou la nouvelle Eloise (1761) Ann an Du Contract Social (1762) sgrìobh e mu dheidhinn na daoine anns a’ chomann shòisealta, saorsa agus ar dleastanasan. Ann an Emile ou de l’Education (1762) bheachdaich e mu dheidhinn an Fhoghlaim is na creideamhan. Fhuair a dubh-chàineadh bho ùghdarrasan na dùthcha is b’ fheudar do Rousseau An Eilbheis fhàgail. Chaidh e thall gu Breatainn còmhla ri David Hume. Thill Rousseau gu Paris ann an 1770 is bhàsaich e ann an Ermenonville ann an 1778. Cha chuireadh idir Rousseau a chuid earbsa ann an creideamh nan daoine (eaglaisean) neo fiù 's anns na leabhraichean cràbhach (uile air an eadar-theangachadh). Tha fhios againn gun do thionndaidh Rousseau gu bhith na Chaitligeach nuair a bha e dìreach 17, ged an do thogadh e ann an Genève Pròstanach. Ach leig e dheth an Eaglais Chaitligeach nuair a bha e 42 ans, air adhbharan poilitigeach. Ann an 1768 phòs e ri Thérèse Levasseur aig Taigh-cùirte ann am Bourgoin, san Fhraing, ach cha d’ fhuair am pòsadh sin beannachadh na h-eaglaise idir, is le sin, a-rèir na laghan a bh' ann aig an àm sin, cha robh am pòsadh laghail co-dhiù. Mar a thuirt esan fhèin: S’ e Crìosdaidheachd a th’ annam, fìor Chrìosdaidh a-rèir an t-soisgeul co-dhiù, ach chan eil mi nam fhear-leantail nan sagart, ach dìreach fear-leantail Iòsa-chrìosd. Tha sin a’ sealltainn gur e Crìosdaidheachd anabarrach a bh' aige, as aonais sgoilearachd diadhaireachd sam bith; Dhiùlt Jean-Jacques Rousseau meadhanaireachd: gun sagartan, gun ministearan, gun diadhairean, cha robh e a’ creidsinn anns na mìorbhailean, neo ann an teagasg a’ pheacaidh-gine nas motha. 'S seòrsa dhe deism reusanta a bh' ann a chuid Chrìosdaidheachd, a fhuair e bho Bhernard Lamy agus Nicolas Malebranche. ↑ Je suis chrétien, et sincèrement chrétien, selon la doctrine de l'Évangile. Je suis chrétien, non comme un disciple des prêtres, mais comme un disciple de Jésus-Christ. 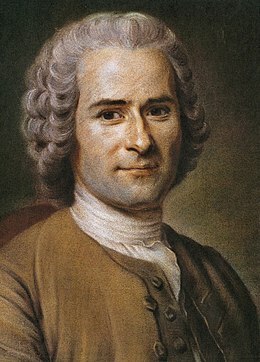 Air a tharraing à "https://gd.wikipedia.org/w/index.php?title=Jean-Jacques_Rousseau&oldid=542763"
Chaidh an duilleag seo a dheasachadh 2 dhen Iuchar 2018 aig 06:54 turas mu dheireadh.